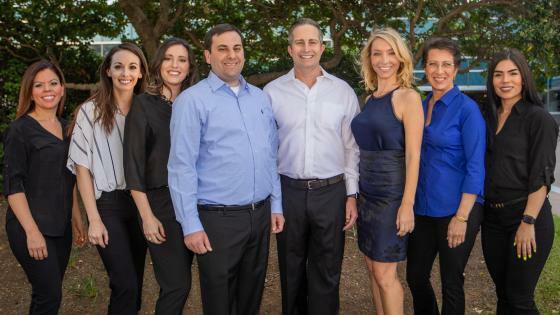 From preventative care to advanced smile restoration, all our services are located under one roof. 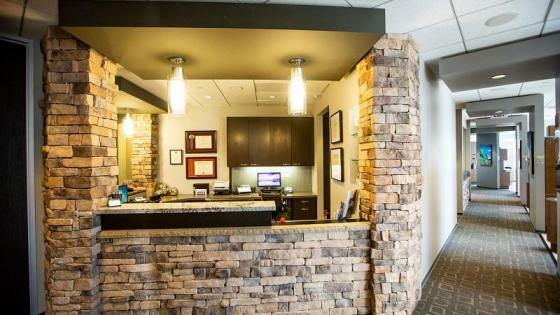 Enjoy a relaxing environment, optional sedation, and professional care in the Houston Galleria area. When you drive up the building feels nice, free and easy parking and easy to find office. 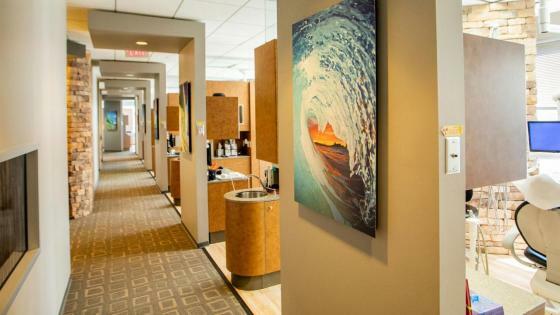 You walk in the office and it feels modern, clean, up to date, water, coffee, chapstick- little touches are noticed. Awesome, friendly, knowledgeable staff! Felt easy, new software and technology, love the spa like hand treatment, chapstick put on your lips, numbing gel and feedback and tips given. Awesome dentists, fun music and nice views of the city. I will recommend to friends. Keep up the great work. Thank you! The staff is very sweet and knowledgeable. Great service . Daisy does excellent work. They are the absolute best people!! 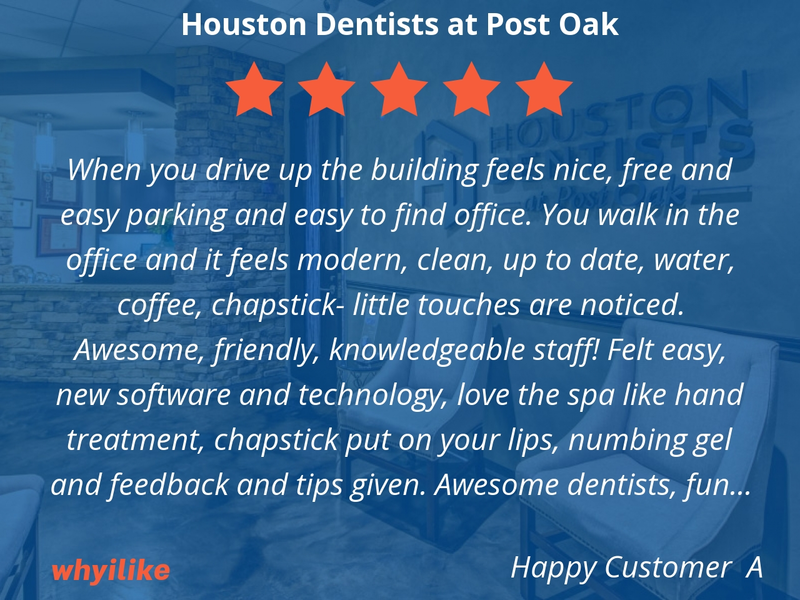 The staff at Houston Dentists at Post Oak are so incredibly welcoming. 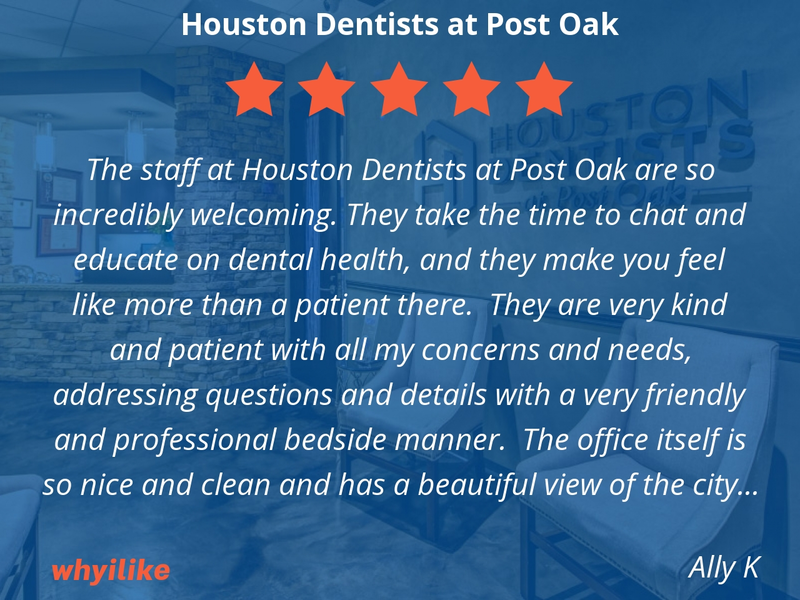 They take the time to chat and educate on dental health, and they make you feel like more than a patient there. 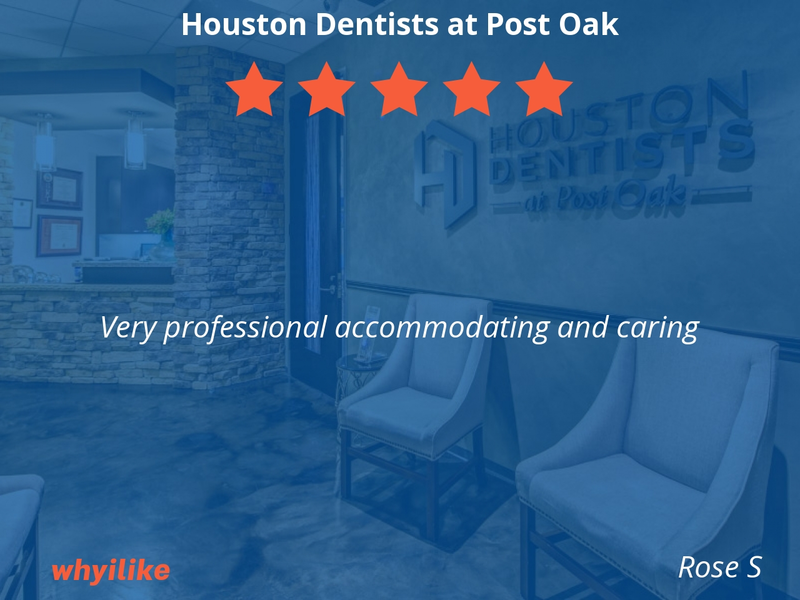 They are very kind and patient with all my concerns and needs, addressing questions and details with a very friendly and professional bedside manner. The office itself is so nice and clean and has a beautiful view of the city scape while you sit in the exam chair. The most important thing is that they make you feel comfortable and at ease before, during and after an exam or procedure. I would definitely recommend this practice for dental care! 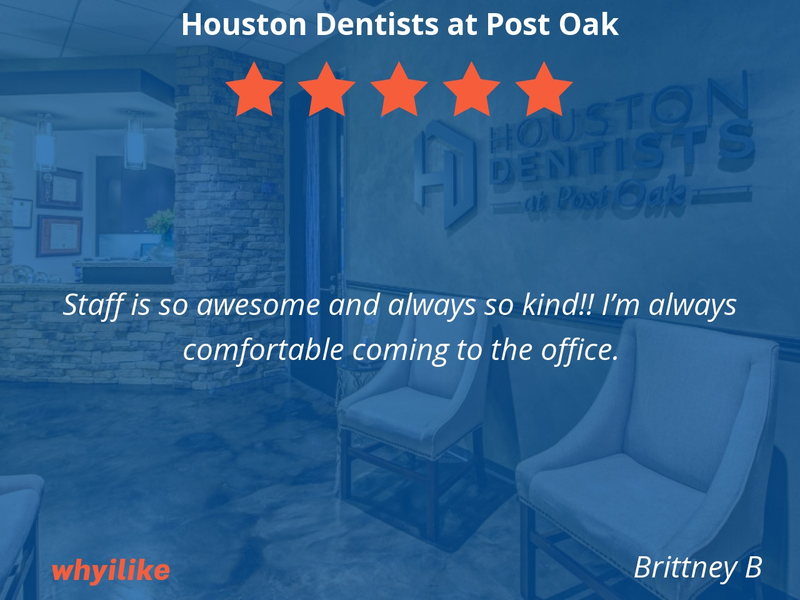 Staff is so awesome and always so kind!! I’m always comfortable coming to the office. Very professional and clean environment. Everyone is extremely nice and helpful. I haven't been to a dentist in well over 9 years and was expecting it to be as painful as I remembered. 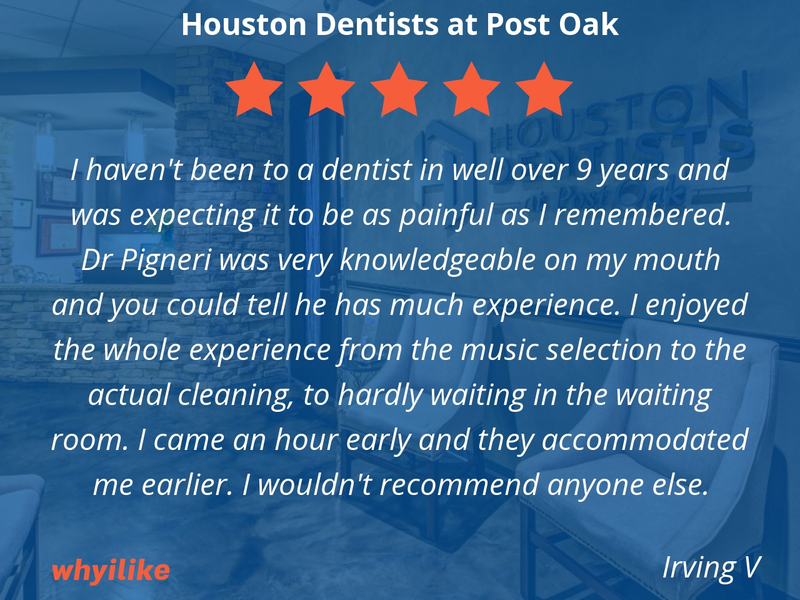 Dr Pigneri was very knowledgeable on my mouth and you could tell he has much experience. I enjoyed the whole experience from the music selection to the actual cleaning, to hardly waiting in the waiting room. I came an hour early and they accommodated me earlier. I wouldn't recommend anyone else. My Hygenist is the best! High standards of service. Very professional and personable. My Dental Assistant was great! 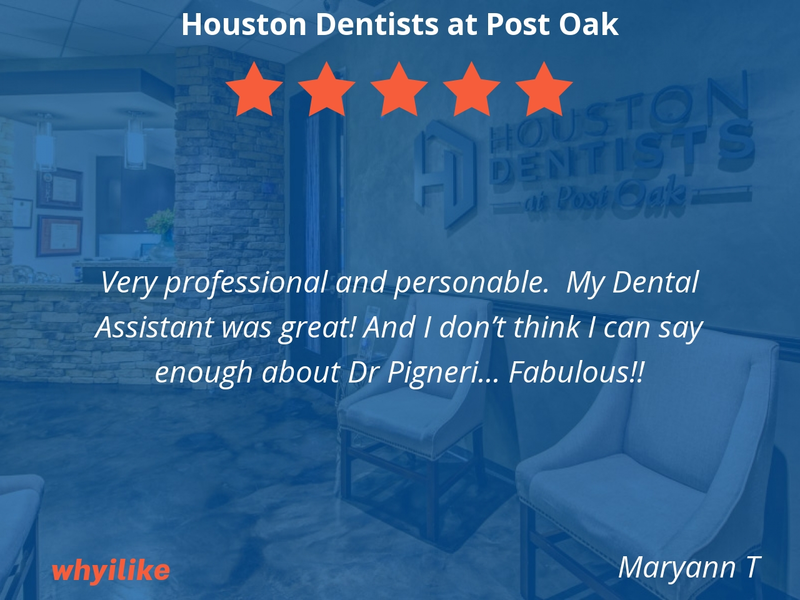 And I don’t think I can say enough about Dr Pigneri... Fabulous!! 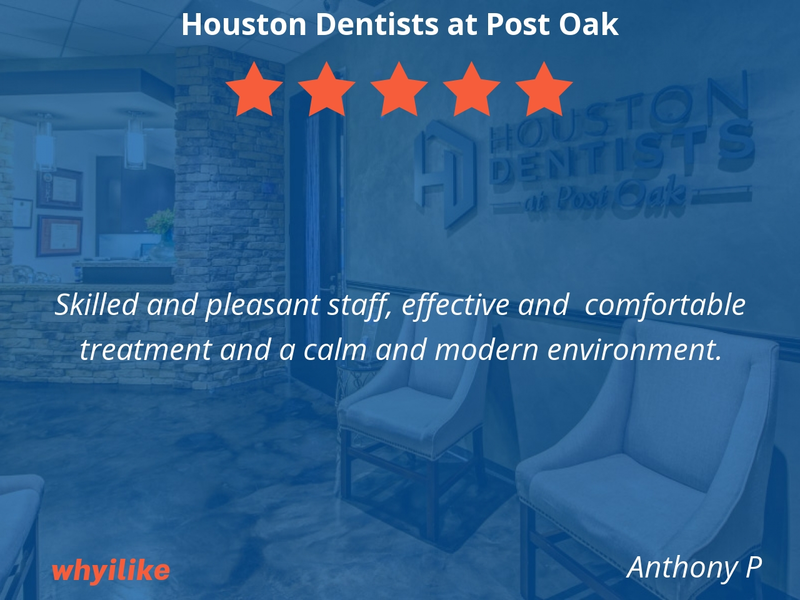 Skilled and pleasant staff, effective and comfortable treatment and a calm and modern environment. Dr. Barras is calming. Totally painless experience. Assistants are patient and kind. Very thoughtful and mindful of working with my sensitivity. Dr Barras and his entire staff are great. 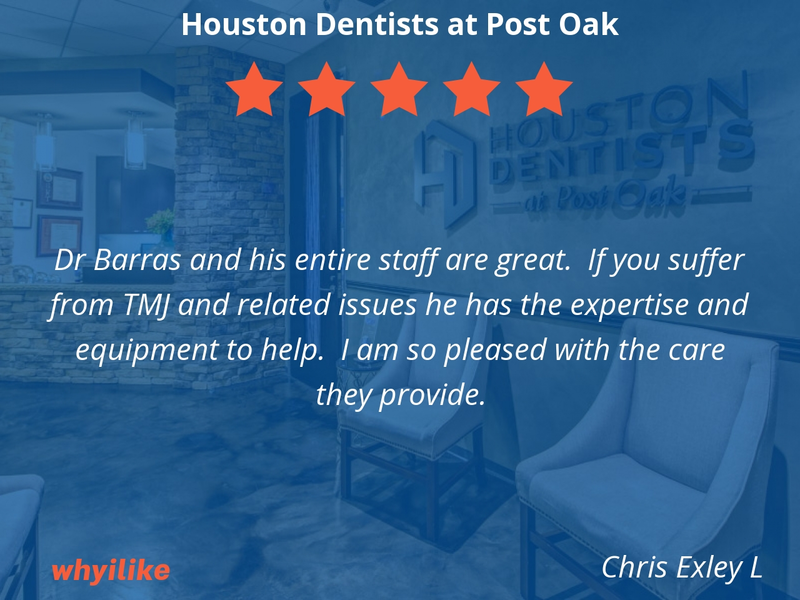 If you suffer from TMJ and related issues he has the expertise and equipment to help. I am so pleased with the care they provide. Professional group of happy staff all doing their jobs well! 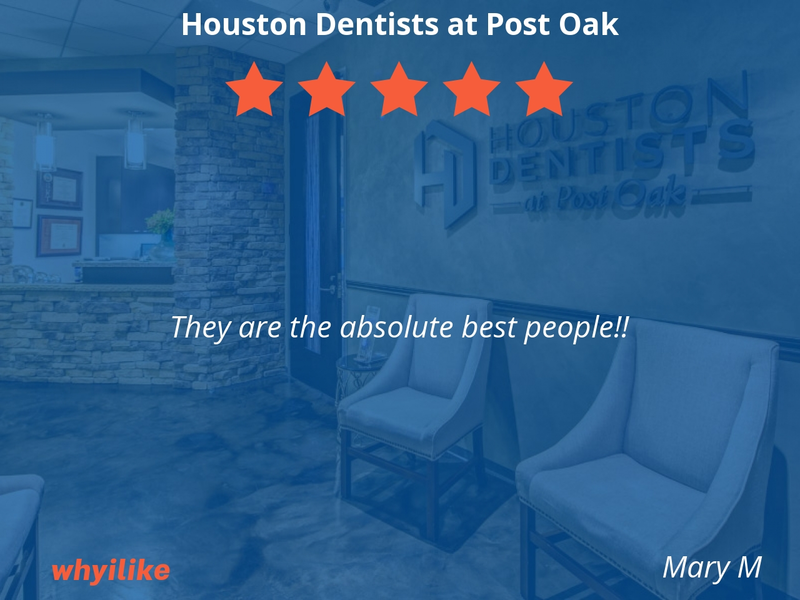 I love all of the awsome staff they do a very great job. I had a crown break over the holidays and they got me in right away. 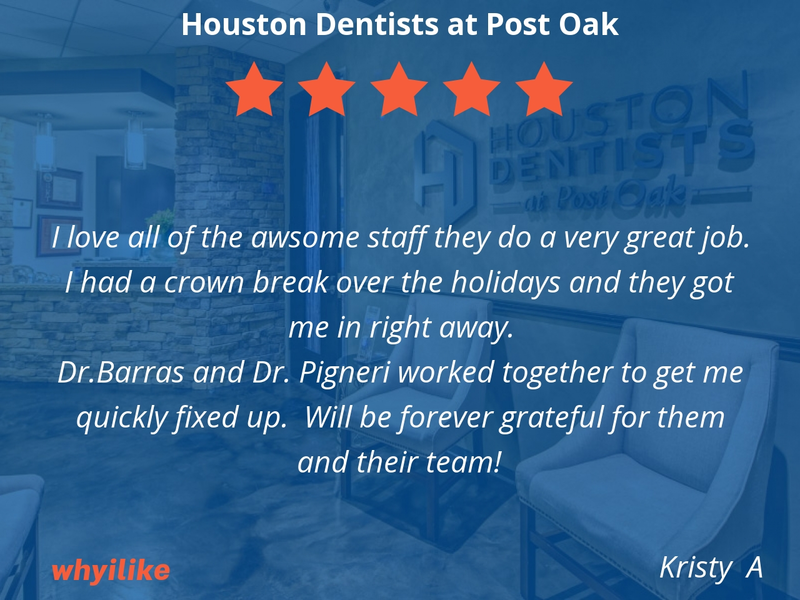 Dr.Barras and Dr. Pigneri worked together to get me quickly fixed up. Will be forever grateful for them and their team! 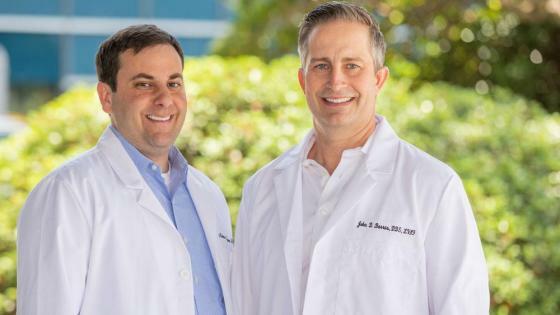 Calm, Profeasional, painfree and they truly care about the patient.